The Logo was a key component in representing Salata’s rich history within the community. Showcasing the Logo with a warm, inviting and organic feel was our primary goal before moving forward with the website re-design. We accomplished this by incorporated an original pencil drawing of the Salata Gurnee Funeral Home – A landmark in the community and a beautiful historic colonial home dating back to 1897. Independently family owned and operated, The Salata Gurnee Funeral Home has been committed to meet the diverse and varied needs of the community since 1971. They continue to serve families by providing quality personal attention and compassion as they did when they first began. When approached by the Salata family to re-design their website, our client was very clear about their objectives. 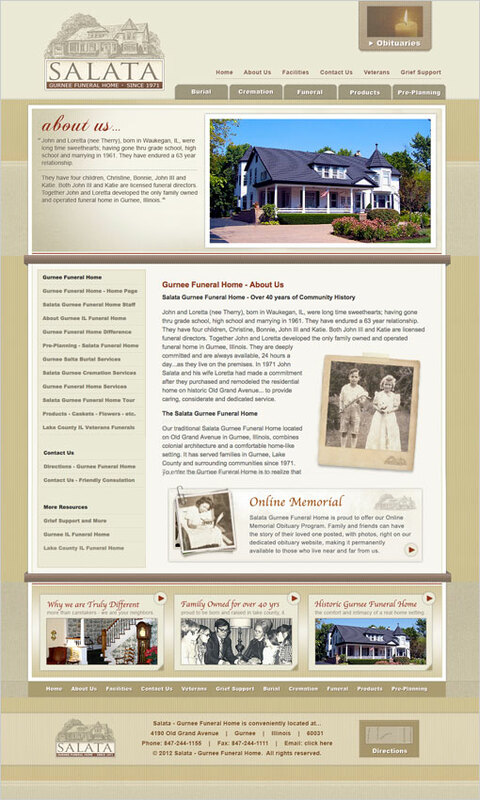 We designed a funeral home website that reflected their rich 40 years history in the community and a warm an inviting appearance that would separate their business from the rest. In addition, we incorporated an online obituary where family and friends could post a story about their loved one, with photos, making it permanently available to those who live near and far from them. We also added “Leave a Condolence” and “Search for a Loved One” functionality, making it very easy for the end user.